When Kate Klimow joins Sherry Main as Staff Advisor to the Regents, it will not be the first time they tackle an ambitious task together. Klimow, chief administrative officer and director of External Relations at UC Irvine Applied Innovation, worked with Main (now assistant vice chancellor of Communications and Marketing at UC Santa Cruz) during Main’s tenure at UC Irvine, and they both joined in the effort to plan the perfect celebration for the university’s 50th anniversary commencement. Klimow will join current Staff Advisor Sherry Main in bringing the voice and perspective of staff to Board of Regents discussions. Departing Staff Advisor Jason Valdry, a director of technology at UC Irvine, completed his two-year term on June 30. President Napolitano selected Klimow as part of a systemwide process, with applications solicited across the UC system. A selection committee composed of systemwide and campus leaders and current and past staff advisors reviewed the applications and selected finalists for the president’s consideration. 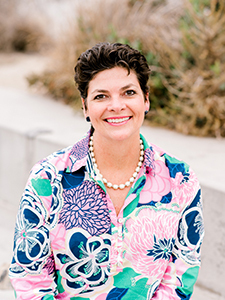 Klimow came to UC Irvine as assistant vice chancellor of Community and Government Relations in 2012, and shifted to her current role with UCI Applied Innovation last year. After her work on the UC Irvine 50th Anniversary Planning Committee was complete, she moved on to the UC Engagement Task Force. Taking part in the UC–CORO Systemwide Leadership Collaborative in 2016 deepened Klimow’s belief in the importance of professional development — and her commitment as staff advisor to expanding development opportunities for UC staff. Learn more about the staff advisor role at the UC Staff Advisors to the Regents website.